TPW magazine | Archive - July 2005 - Who Owns the Water? A primer on Texas groundwater law and spring flow. The interrelationships between groundwater, aquifers and springs are not obvious to the casual observer. When water bubbles up from springs, it appears as though the earth itself is giving birth to cool, clean water. It can be difficult to imagine the convoluted path water takes to arrive at a spring, from the sky down through seemingly solid ground, seeping through minuscule cracks between rocks to land in an aquifer, and then back to the surface again. Yet these days, the water is often diverted or simply used up before it has the chance to make it to a spring. Many factors have contributed to the drying of Texas springs, but groundwater law that encourages pumping of aquifers is a major factor. The drying of Comanche Springs, located in Fort Stockton, is a telling example. Comanche Springs was a Texas treasure. It was a stopping point for early travelers, and later for residents, tourists and farmers. In 1849, a United States Army reconnaissance party headed by Captain William Whiting reached Comanche Springs and described the water as being clear and abundant in fish and soft-shelled turtles. Soon thereafter, the United States Army established Fort Stockton near Comanche Springs to provide protection from raiding Indians to travelers and mail couriers. As early as 1875, farmers began using the water from Comanche Springs for irrigation. One account measured the 1899 flow at some 500 gallons per second. By the 1930s, Comanche Springs drew visitors and tourists to enjoy these unique waters in an area of the state noted for its lack of rainfall and rivers. A bathhouse, swimming pool and pavilion were constructed at Comanche Springs in 1938. One day in 1950, children swimming and wading in the pool noticed that the water no longer bubbled up from the bottom of the pool. Alarmed by the fact that Comanche Springs seemed to be drying and dying, the city and farmers that relied on these spring flows hired water experts to identify the cause of the problem. The experts reported that the large number of irrigation water wells drilled into the aquifer lowered the water level in the aquifer and caused Comanche Springs to go dry. After negotiations with the surrounding well owners failed, a lawsuit was filed to stop the well owners from interfering with the normal flow of water from Comanche Springs. The lawsuit, titled Pecos County Water Control and Improvement District No. 1 v. Clayton Williams, et al., 271 SW2d 503 (1954), sought to regulate overpumping in order to protect the springs. This lawsuit defined Texas groundwater law and the protection, or the lack of protection, of springs. In 1954, the Texas Court of Civil Appeals ruled that the groundwater contributing to the flow in Comanche Springs belonged to Clayton Williams while it was under his land. 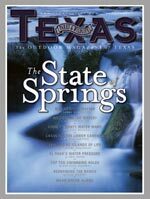 The Court rejected all legal claims of the Pecos County Water Control and Improvement District to the groundwater and said that its right to the springs attached only after the water emerged from the ground and that prior to that time, the defendant could beneficially use any amount of water regardless of the impact on the springs. The legal principles from the Comanche Springs case were tested again in 1989, in a case titled Denis v. Kickapoo Land Co, 771 SW2d 235. The Austin Court of Appeals again ruled that a well sunk into the underground cavern just beneath Kickapoo Creek was capturing groundwater and thus the well owner was not liable for a reduction in spring flow. Texans use nearly 17 million acre-feet of water each year. One acre-foot is a common measure used to explain water usage. An acre-foot of water would cover a high-school football field to a depth of one foot. It equals 325,851 gallons, which is about the amount of water a family of five uses in a year. Groundwater provides about 60 percent of our water, with rivers and reservoirs providing the rest. About 80 percent of our groundwater is used for agricultural irrigation, mostly in the Texas Panhandle, the Lower Rio Grande Valley and areas around San Antonio. Most of the arid western part of the state and a significant part of East Texas rely on groundwater for municipal and manufacturing uses. Aquifers are storage basins for groundwater and are the headwaters of springs. Texas aquifers are like droughts; no two are exactly alike. Some aquifers are highly rechargeable and can store large volumes of water, while others have little recharge and have limited storage. Still others have little recharge but store a large volume of water. For example, the Ogallala, underlying the Texas Panhandle and parts of six other states, is a huge aquifer holding water deposited during the Ice Age. Due to limited rainfall and to the caprock layer overlying the Ogallala, the Texas portion of the aquifer receives very little natural recharge. In contrast, the Edwards Aquifer, located beneath San Antonio, is highly rechargeable and subject to rapid depletion but can be quickly replenished by rainfall. Groundwater from the Edwards is responsible for creating many of the springs in the area, including Comal Springs in New Braunfels and San Marcos Springs in San Marcos. Some estimate that nearly 30 percent of the water in the Guadalupe River comes from Edwards Aquifer spring flow. Texas has linked its law to the geological container holding the water. We recognize three distinct containers for water — natural surface water, diffused surface water and groundwater — and have developed laws for each category of water. In contrast, most western states allocate, manage and protect both surface and groundwater based on the law of prior appropriation. Under the Texas Water Code, all natural surface water found in watercourses is owned by the state and is held in trust for the people. This water includes the ordinary flow, underflow and tides of every flowing natural watercourse in the state (a watercourse has a definite bed and banks). Storm water and floodwater found within natural lakes, rivers and streams is also state water, as is the water in springs that form headwaters of natural streams. This water is allocated under the prior appropriation water law doctrine. A central feature of this doctrine is the “first-in-time, first-in-right” rule, which gives the water to the most senior water rights holder during times of scarcity and drought. Water that does not flow in a defined watercourse, but flows across the surface of land in a variant and unpatterned way is termed diffused surface water. Generally, this is rain runoff, although water left in upland areas after a flood recedes may also qualify as diffused surface water. Texas courts have ruled that diffused surface water belongs to the landowner until it enters a natural watercourse. When it enters a natural watercourse, it becomes state water. This is water beneath the land surface that fills the pore spaces of rock and soil material and that supplies wells and springs. Texas treats groundwater differently than surface water. Whereas surface water is considered state property, groundwater is private property. Texas follows the Rule of Capture in determining ownership of groundwater. Under this rule, groundwater is considered the private property of the landowner. The Texas Supreme Court first adopted the Rule of Capture in 1904 in a case titled Houston & T.C. Ry Co. v. East 81 S.W. 279. Just six years ago it reaffirmed the rule in Sipriano v. Great Spring Waters of America, Inc. 1 S.W.3d 75, also known as the Ozarka case. In both cases the court said that landowners have a legal right to withdraw as much groundwater from beneath their land as they can capture. In withdrawing and using this water in a beneficial manner, they have no liability for any harm to neighboring wells. In a practical sense, the surface owner does not actually own the water until they capture it. Because of this, the Rule of Capture has often been called the law of the biggest pump. Texas landowners actually have three types of rights under the Rule of Capture. One is the right to try to capture groundwater, the second is the right to the water actually brought to the surface and captured and the third is the right to use or sell this water. All three rights can be sold, or leased to others. Once sold or leased, any water captured may be transported off the land, or exported outside a county or region. The Rule of Capture is subject to certain limitations developed by Texas courts and the legislature. Each limitation can restrict the amount of groundwater a landowner can pump. In a negligent manner so as to cause nearby land to subside or settle. In theory, these three exceptions seem to be major restraints on landowner abuse; yet, as applied by Texas courts they have not limited overpumping and aquifer exploitation. For example, in City of Corpus Christi v. Pleasanton, the Texas Supreme Court ruled that landowner pumping, if done in a wasteful or malicious manner, could be halted. However, it refused to find waste in the transportation of groundwater some 100 miles through a surface watercourse even though three-fourths of the original supply was lost in transit due to evaporation and seepage. Correspondingly, in Friendswood Development Co. v. Smith-Southwest Industries, Inc, 576 S.W.2d 21 (1978) the Texas Supreme Court ruled that landowners could recover damages for subsidence losses caused by negligent pumping of groundwater but could not recover if their well went dry. Regulated by a groundwater conservation district. These restrictions illustrate that groundwater, while privately owned, may be regulated by the state legislature. Section 11.021 of the Texas Water Code states that groundwater making up the underflow of a river is state property. Underflow is not defined by statute, but one court has held that it is that portion of the flow of a surface watercourse occurring in the sand and gravel deposits beneath the surface of the stream bed. In order to be underflow, it must be hydrologically connected to the surface flow of the stream. Even though the Texas legislature has the ultimate regulatory authority over groundwater management, it has delegated this responsibility to local groundwater conservation districts. To date, 83 local groundwater conservation districts have been established throughout the state and four more are awaiting confirmation. Chapter 36 of the Texas Water Code gives districts extensive legal authority. They can register and permit wells, keep drilling and well records, regulate well spacing and production, require a permit for water transfers, buy and sell water, undertake aquifer storage and recovery projects, levy taxes and pumping fees and generally engage in projects to conserve and protect the aquifer. However, most districts only require well registration, or require that new wells be drilled a certain distance from existing wells. Many have not changed the capture rule by limiting and enforcing the amount of water pumped from any given well. Critics suggest that since few districts actually require meters on wells, they cannot enforce pumping limits because they don’t know how much water is actually being pumped. While the Texas Supreme Court has sustained the authority of districts to regulate groundwater, they have not precluded landowners from challenging district rules for the taking of private property. The law is seemingly well established that once groundwater bubbles to the surface and becomes part of a watercourse, it becomes state-owned surface water. If, however, the groundwater is captured before flowing to the surface, it is the property of the landowner. Except for the Edwards Aquifer Authority, which regulates groundwater pumping in order to protect springs and the threatened and endangered species that live there, neither the Rule of Capture nor groundwater conservation districts explicitly protect the springs of Texas. This year marks the 101st anniversary of the Rule of Capture. Suggestions to revise or replace the Rule of Capture have come from a number of landowners, interest groups, citizens, water officials and even some legislators. Just what change will emerge is uncertain. One thing is certain: Unless a consensus emerges from among the many politically active water stakeholders and interest groups, the legislature will be reluctant to make major changes to the Rule of Capture and, under that rule, Texas springs will continue to go dry.